Porcupine quills have antibiotic properties, as porcupines sometimes “quill” themselves. This stout, short-legged mammal is 25 to 31 inches (73-78 cm) long and is covered with hair (except on the foot pads and nose) and quills of varying length. The tips of the long guard hairs are lighter and give the coat hues of yellow or white. The hair on the belly is sparse and varies from black to brown. The hair and a thick layer of body fat helps keep the porcupine warm during the winter. The tail is extremely muscular and adapted to aid in climbing and defense. The upper surface of the tail is heavily covered with quills, while the underside is covered in bristle-like hairs used to aid in climbing. The quilled pelage of the porcupine makes it unique among North American mammals. Quills cover the body, except on the legs and belly. The quills are modified hairs which have microscopic overlapping sheaths on the tips (functioning like barbs) are filled with a spongy matrix. Quills from different parts of the body vary in length, flexibility, color, shaft diameter, and barb length. The average weight of an adult male porcupine ranges from 22 to 27 pounds (about 10-12 kg), but some individuals can weigh up to 30 pounds (13.6 kg). Adult females weigh 15 to 18 pounds (7-8.5 kg), about ten percent less than the males. The porcupine has excellent senses of smell, hearing, and taste. Porcupines make a wide variety of sounds ranging from whimpers to screams, depending upon the circumstance. Breeding takes place in the fall, usually in September in Alaska. Males seeking receptive females expand their home ranges up to five times the normal size. If more than one male shows interest in the same female, they will fight for the opportunity to mate with the female. Males use their incisor teeth and quills when fighting, and usually the largest and heaviest male wins. The breeding male then splashes the female with urine. If she is not ready to mate, she shakes off the urine and leaves. If she is ready, she stays and the male mounts in the traditional posture with the female in front and the male in the rear. She will curl her tail over her back, covering most of the quills. Males reach sexual maturity at 24 months and females at 12 months. After a gestation period of about 210 days, only a single young is born. The gestation period is extremely long for a rodent. At birth the young weighs between 1 and 2 pounds (0.5-1.0 kg) and is about 10 inches (25 cm) long. Its eyes are open and its body covered with long grayish-black hairs and quills. Within a matter of hours the quills dry and serve as protection. The young porcupine is then capable of following its mother, although the young will not be able to climb large trees for several weeks. The young are able to eat some vegetation after a few weeks, but the female continues nursing the young for 3.5 months. During the summer the young stay close to their mothers, learning about den sites and food trees, but toward the end of summer they start to spend more time apart. By October, when the female mates again, the young are fully weaned and wander off to face the winter alone. Porcupines are relatively long lived and can live up to about 18 years in the wild. Porcupines may be active in the day but are mostly nocturnal. During the day they sleep in a tree, a hollow log or among rocks or tree root-wads; they do not build a nest. During severe winter weather they might den up with other porcupines, otherwise they are solitary except for mother and baby. A porcupine has a home range, the size varies in depending on the area, (studies have shown home ranges varying from 25-35 acres, to as much as 70 acres in others). Porcupines they learn the denning sites and seasonal food resources in the area. Porcupines utilize natural cavities, such as rock caves, hollow logs and trees, or even the thicker vegetation in a tree as dens. Porcupines stay active throughout the winter. Porcupines are primarily arboreal, and spend most of their time in the winter feeding in trees. They are powerful climbers but do occasionally fall from trees. Thirty percent of the animals examined in one study showed evidence of healed fractures indicating that they had fallen out of trees. 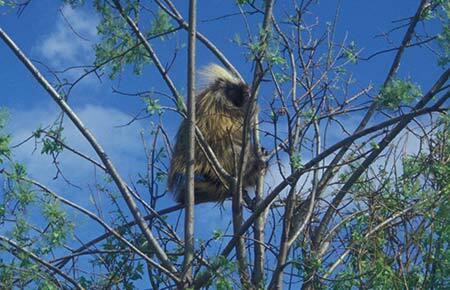 When climbing, the porcupine uses the stiff bristles on the undersurface of the tail as support. The animal has long, curved front claws which also aid in climbing. When the porcupine is relaxed, the hair and quills lie flat and point backwards. When threatened, the porcupine draws up the skin of the back to expose quills facing all directions, and it then presents its formidable bristling back. The porcupine tries to keep its back facing the attacker and strikes back and forth with its tail. Contrary to popular belief, a porcupine cannot throw its quills. However, quills are readily dislodged on impact which may give the impression that quills can be thrown. Porcupines use a combination of warning signals, which also serve to reinforce the lesson a dog or potential predator might learn from an encounter. Porcupines produce a chemical scent from a patch of skin on their backs near the base of their tails called the rosette. Biologist Uldis Roze describes it as having a “penetrating quality similar to the smell of goat or perhaps exotic cheese.” Others compare it to strong, unwashed human body odor, marijuana and coconut. In his book, The North American Porcupine, Roze identifies the molecule responsible for the odor as R-delta-decalactone. A predator associating the odor with a painful encounter may be more likely to avoid a repeat experience. The display of quills also provides a visual warning. The defensive position with the back to the attacker, tail ready to swat, displays the rosette, a striking mass of black-tipped white quills. The quills also have a fluorescent quality which makes them appear brighter and whiter in low light, when porcupines are most active and likely to encounter a predator. Other specialized quills in the rosette help wick and disseminate the odor-producing molecules. Sound is a third signal. When threatened a porcupine may also slap its tail against the ground and chatter and clack its teeth. The inner bark (phloem and cambium layers) of spruce, birch and hemlock and spruce needles are the major winter foods for porcupine living in Alaska. In the spring and summer, buds and young green leaves of birch, aspen, cottonwood and willow are eaten until the tannin levels build too high for the porcupine to tolerate. Because they are vegetarians and most vegetable matter is very low in sodium, porcupines need additional sodium in the blood to balance cell potassium levels. As a result, porcupines seek out salt sources such as natural licks, glue which bonds plywood together, human perspiration on tools, road salt, and some paints. Porcupines also feed on shed antlers and the bones of dead animals to obtain sodium and calcium. The salt drive is primarily in the spring when porcupines are sodium deficient. Studies have shown that porcupines have sophisticated taste and dietary preferences. They will seek out and identify the most nutritious foods available at different times of the year and learn and remember these. Because they tend to be somewhat sodium deficient, they avoid or minimize the intake of acidic foods that require more sodium to metabolize. It’s often possible to see small chewed patches on trees where a porcupine has sampled the cambium and moved on. Porcupines are found throughout most of the forested areas of the state. They are not found on Prince of Wales Island in southern Southeast Alaska and the neighboring islands to the west. Evidence suggests they never colonized these islands after the ice age. 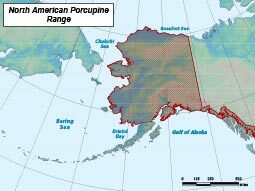 There have been no population assessments done on porcupines in Alaska, populations are assumed to be stable but more study is warranted. Declines have been noted in parts of the Lower 48 (Northwestern Montana and Utah) for reasons that are not understood. It has been speculated that declines in parts of California could be attributed to predation by increased numbers of mountain lions – some predators do become skilled at catching porcupines. Porcupines have a low reproductive potential – they have a long gestation period (remarkably long for a rodent), they may not reproduce every year and if they do a female gives birth to just a single baby, and they don't become sexually mature until they are two or three years old. So a population would be slow to recover from a decline. Vehicles pose a threat (porcupines may well be the number one road kill in Alaska) especially in the spring and fall. In the fall mating season porcupines are on the move, and in the spring they are drawn to roadsides because of early, emerging vegetation. Fireweed grows well along roadsides and the emerging shoots are popular with porcupines. Development and forestry practices that impact habitat can affect porcupine numbers. Average 15-20 pounds, some reach 30 pounds. Plants, inner bark of trees. Fisher outside Alaska; wolves, wolverines, coyotes, and lynx sometimes learn how to successfully catch, kill and skin porcupines. Porcupines evolved in South America and moved into North America about three million years ago during the Great American Interchange, when tectonics pushed the two continents together and a bridge was created in Central America.